We’d love your help. Let us know what’s wrong with this preview of Apostle Unbound by Richard Godwin. A serial killer crucifying politicians and evading justice. A dark blood-stained legacy. Scores to settle. After the disappearance of the notorious serial killer in Apostle Rising, the prequel to Apostle Unbound, the killer returns. Not only, that he has founded a cult and has plans to remove major politicians all over post-Brexit Britain. ˃˃˃ Not only, that he has founded a cult and has plans to remove major politicians all over post-Brexit Britain. Oh, and then there is a personal score to settle with his mentor. The debut novel contained the mother of all shocks, and this novel is no different. Compelling, cark, profound, mysterious. To ask other readers questions about Apostle Unbound, please sign up. This exciting book has been my first experience with this author, and I have to say that it's been a very enjoyable read. Story-telling is of a very good quality by the author, and the story is brought to us in a very quick pace, going from one situation right into another, so much so that it certainly will keep you on your toes, right until the end. The book is mainly set in London, and is at first about a retired cop, Frank Castle, the man who failed to solve the Woodland Killings, and who use t This exciting book has been my first experience with this author, and I have to say that it's been a very enjoyable read. The book is mainly set in London, and is at first about a retired cop, Frank Castle, the man who failed to solve the Woodland Killings, and who use to be the partner of the now Police Inspector, Jacki Stone, who's leading now the investigation of the murder of Katlyn Norris, Frank Castle's ex-wife, while being also on the search for a serial killer by the name of Elijah, who's the long lost son of Frank Castle and Katlyn Norris. It's also very important to note that a serious role is to be played by a man called, Karl Black, who's now inside in prison but still pulling the strings in the outside world. As Frank Castle is ever deeper sinking into very dark moods, thanks to his heavy drinking, the hunt for Elijah will become more and more difficult for him, while at the same time although having domestic problems with her husband Don, PI Jacki Stone and her assistant Nash will discover two sinister murders of prostitutes shortly after Frank Castle visited them. In the meantime while doing business in Bolivia and living in Mexico, Elijah is doing everything he can to raise a New World and with him as the leader, the God of a group of people called "The Gathering", and that all in an attempt to rid the world of corruption and incompetence by using violence and war. What will definitely follow is that more murders will occur in London by a surprising and unseen hand, I'm not gonna reveal who because that's for you reader to find out, and Elijah has also come to London to settle some scores, and to show that he the pupil, Elijah, has outgrown his master, Karl Black, with the inevitable consequences, before he gets back to Mexico where it will come to a final showdown between Elijah and his long lost "False Father", Frank Castle, and what will happen in the end is once again for you reader to find out by reading this thrilling book. Although this has been my very first book from this author, I highly recommend this book to anyone who likes a suspenseful fast-paced thriller, and I for myself will absolutely looking forward to read more books from this author in the future, and what this book concerns I like to call it: "An Action-Packed Killer of a Thriller"! Frank Castle has retired from the police department after struggling to solve the Woodlands murders and he is still taunted in the press by his inability to catch the killer. He has given in to the bottle and spends many of his days drunk and barely getting by. When he receives a note to an address and finds his ex, Kaitlyn murdered he is dragged back into a series of bizarre murders that lead him to his son, Elijah. But will his ex partner, Jacki Stone be able to help him catch the new killer or Frank Castle has retired from the police department after struggling to solve the Woodlands murders and he is still taunted in the press by his inability to catch the killer. He has given in to the bottle and spends many of his days drunk and barely getting by. When he receives a note to an address and finds his ex, Kaitlyn murdered he is dragged back into a series of bizarre murders that lead him to his son, Elijah. But will his ex partner, Jacki Stone be able to help him catch the new killer or will he constantly remain one step ahead of them? When Elijah’s plans involve taking down more than Frank ever dreamed possible will he be able to stop him? This is the second book in the series and I did not read the first so my views may be a little different than someone who has read the first one. That being said I believed there were a few things I definitely missed but I was able to catch up quite quickly and figure out certain relationships. Frank is an interesting character that I felt sorry for. He had been tormented in the press for his inability to catch a killer and then when he is linked to another one personally he begins drinking and starts falling apart. Yet he is dragged into another case with the death of Kaitlyn and he knows Elijah is sending messages to him. I liked Frank’s old partner Jacki Stone and I felt bad that her marriage to Don was falling apart due to work stress and the loss of a baby. I was horrified what happened to her in the book and I was so grateful that her partner Nash got to her. I was also shocked with the twist involving Don and how that all played out with his cheating. Elijah was such a complex character who had serious issues but at the same time he was caring with Annabel. He was brilliant in his planning and I was blown away by the things that he did through the book. There were definitely some twists with him that I was not expecting at all!! The book leaves you constantly wondering what is going to happen next as there are so many twists to shake you and your brain up. The book is dark but at the same time it makes you keep flipping the pages and make you wonder what the author has planned for you next. I was surprised by what Frank discovered about “Mickey Mouse” as I was not expecting that. 5 out of 5 stars Read Apostle Unbound for the pure thrill of it! Richard Goodwin in Apostle Unbound has written a suspense filled thriller that will have you spellbound and always wanting to read just one more chapter into the wee hours of the night. The author has that unique ability to paint a picture with words that has you feeling you are present in each scene. His characters are so life like and the bad guys so evil. I will not give away any of the plot 5 out of 5 stars Read Apostle Unbound for the pure thrill of it! 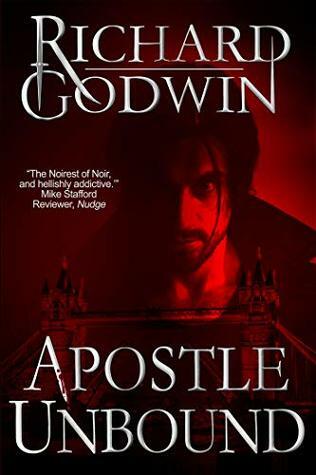 Welcome to The Theatre Of Dreams...Apostle Unbound, by Richard Godwin, is a gripping crime suspense thriller, exactly as the book’s subtitle proclaims it to be. I am in full agreement with that. I would also accept the book in the occult suspense genre. I also think that “Theatre Of Dreams” would have made a fitting subtitle had it been chosen as such. The setting for this story is primarily in London. The plot takes you from London, to Mexico, and also to Las Vegas. A serial killer, Karl Black, Welcome to The Theatre Of Dreams...Apostle Unbound, by Richard Godwin, is a gripping crime suspense thriller, exactly as the book’s subtitle proclaims it to be. I am in full agreement with that. I would also accept the book in the occult suspense genre. I also think that “Theatre Of Dreams” would have made a fitting subtitle had it been chosen as such. The setting for this story is primarily in London. The plot takes you from London, to Mexico, and also to Las Vegas. A serial killer, Karl Black, has been captured and put behind bars. This serial killer, with a diabolical mind, has managed to influence the son (Elijah) of the policeman (Frank Castle) who captured him (Karl Black) to recreate the same horrendous crimes that Black did. That accounts for the opening line: “The journey took Frank Castle back to the place of hidden identities, the father seeking a son he wished he didn’t have.” That sentiment holds up from first page to last, because Elijah is not the kind of son any decent man would ever be proud of. So, why is Frank Castle looking for Elijah, his son? As I already said, his son is a serial murderer, who is under the influence of another serial murderer. It is a clever plot, and if you’re like me, you are tempted to just turn to the last page and see how everything turns out in the end. I didn’t do that. I recommend that you don’t do that either. Yes, the book is only 238 pages long, but I read all 238 pages in one sitting, about 2 hours reading time approximately. That said, this book presents the reader with a complex human drama that is evident in the first line of the book. On each successive page, page after page, the tension mounts. Author Richard Godwin keeps you in suspense, gradually increasing the level of suspense by skillfully weaving in a large number of secondary characters and incidents. This is not a distraction because it adds substance and background to the fundamental issue being dealt with: a policeman is hunting down his own criminal son. Everything else must contribute to developing and “fleshing out” that basic question which I now ask you: What would you do if Elijah (serial killer) were your son? If crime fiction is your genre, and you enjoy fast-paced, high-suspense, drama with an unexpected twist for an ending, then this is your book. I want to add, finally, that given the kind of world we are living in nowadays, it isn’t even necessary to suspend disbelief. That is to say, the events in this book fit within the boundaries of the evening news on any given day. I give this book 4 and a half stars out of 5 because, in my opinion, the story clearly demands that Mexico, at the latest, is the place for Frank Castle’s demise. Because it isn’t, a sequel, with a future confrontation of good versus evil, with Frank Castle as protagonist, is again necessary. Frank is an interesting character that I felt sorry for. He had been tormented in the press for his inability to catch a killer and then when he is linked to another one personally he begins drinking and s This is the second book in the series and I did not read the first so my views may be a little different than someone who has read the first one. That being said I believed there were a few things I definitely missed but I was able to catch up quite quickly and figure out certain relationships. The very end left me in shock and I was so surprised and now to wait! Apostle Unbound is written by Richard Godwin. I have been given an advanced copy to read, with no obligation to review, but I just had to review this anyway. Excellently written, this is my kind of story. I don’t watch a lot of TV., but this would be what I was looking to watch. It is a good old crime with a few deluded serial killers. I think it has 11 sections and approximately seven chapters within the sections, so a nice long read, but it felt like it took two minutes. I am not sure which wa Apostle Unbound is written by Richard Godwin. I have been given an advanced copy to read, with no obligation to review, but I just had to review this anyway. Excellently written, this is my kind of story. I don’t watch a lot of TV., but this would be what I was looking to watch. It is a good old crime with a few deluded serial killers. I think it has 11 sections and approximately seven chapters within the sections, so a nice long read, but it felt like it took two minutes. I am not sure which way round I have read the book, as in if it follows another book. This may be the second in the series, but it ended as if there will be another; which I will definitely read. Richard Godwin is the author of critically acclaimed novels Apostle Rising, Mr. Glamour, One Lost Summer, Noir City, Meaningful Conversations, Confessions Of A Hit Man, and Paranoia And The Destiny Programme. He is also a published poet and a produced playwright. His stories have been published in numerous paying magazines and over 34 anthologies, among them The Mammoth Book Of Best British Crime a Richard Godwin is the author of critically acclaimed novels Apostle Rising, Mr. Glamour, One Lost Summer, Noir City, Meaningful Conversations, Confessions Of A Hit Man, and Paranoia And The Destiny Programme. He is also a published poet and a produced playwright. His stories have been published in numerous paying magazines and over 34 anthologies, among them The Mammoth Book Of Best British Crime and The Mammoth Book Of Best British Mystery, as well as the anthology of his stories, Piquant: Tales Of The Mustard Man. Richard Godwin was born in London and obtained a BA and MA in English and American Literature from King's College London, where he also lectured. You can find out more about him at his website www.richardgodwin.net , where you can also read his Chin Wags At The Slaughterhouse, his highly popular and unusual interviews with other authors.